@breakthesystem HELP! I'm gonna be spending 3 months in munich soon. I'm afraid I have no idea wtf this says, though i recognize it as a bavarian dialect. I already have nightmares of being stranded in the night, somewhere in munich, naked, shivering and not understanding anyone around me. @thunfisch Munich ppl by and large are pretty nice, even if you don&apos;t speak the local language and only Hochdeutsch. Don&apos;t worry, you&apos;ll be fine. Hit me up for coffee if you feel like it. 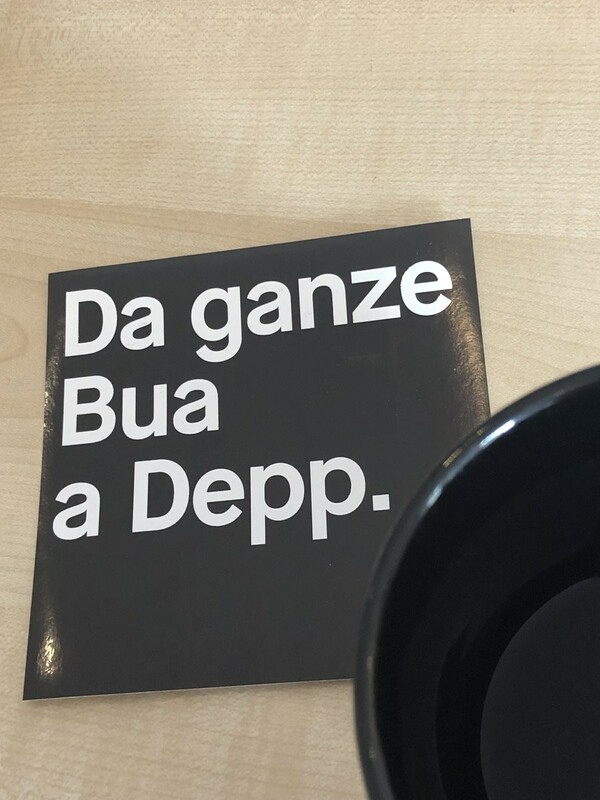 And the translation is "This boy is a complete idiot" / "Der ganze Junge (ist) ein Depp"
Yes I mean usually we have to bribe you with compliments, bad puns and selfies .